The Bridal Gallery > News and Features > Features > Before you go Wedding Gown shopping……..
Before you go Wedding Gown shopping……..
We know it’s exciting! You’re excited, your friends & family are excited – everyone’s looking forward to shopping for The Gown. However, before you start, just take a moment to read a few notes that we’ve put together for you……. Know your budget and stick to it. 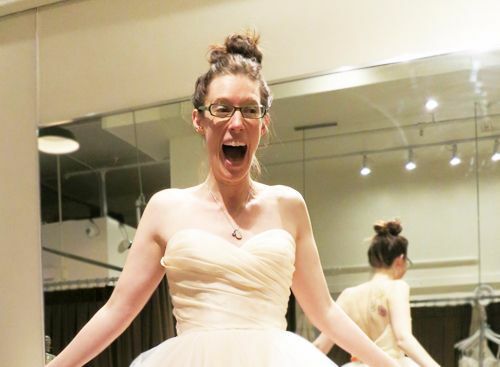 The worst thing a bride can do is try on a dress that’s way out of her budget, and then fall in love with it. After that, it’ll be hard to find a dress you love just as much that’s within your budget. One way to safeguard your experience: let your Bridal Consultant know your budget when you make your appointment. If the shop doesn’t stock dresses in your price range, they’ll let you know. Set aside a special day just for dress shopping. You want to be fresh and relaxed, as finding your gown is such a special time. We’d recommend visiting two to three boutiques so that you see enough dresses. If you visit too many shops and try on too many dresses confusion will set in. While it can be fun to have a parent, friend, or future in-law with you, bringing along the whole crew can be less than helpful. Too many voices & opinions in the room can make the appointment feel overwhelming, and brides often leave without a sense of what they like and don’t like. We’ve often had girls step out of the changing room in a dress that they love, only for a member of their wedding party to loudly declare that they ‘hate it’, and effectively crush the dreams of the Bride! Limit the guest list to two or three people whose opinions you respect the most. You’ll be all dolled up on your wedding day, so why not do the same when you’re trying on dresses? Do you your hair and make-up, so that you feel your absolute best on the day you’re trying on gowns. It’s not just about what’s happening from the neckline to the hem – it’s the whole look. If you’re thinking of wearing your hair up on the day, try and put it up, however, roughly. Also wear, or take with you some jewellery that you may be thinking of wearing on the big day. While we don’t expect you to bring your entire underwear drawer it’s a good idea to wear a pair of seamless undies or some of those fabulous pants that pull you in, in all the right places, and also a strapless bra. With the right undies, you’ll have a better idea of how a dress will look and how comfortable you’ll be in it. By all means, share any ideas that you have with your Bridal Consultant, but also please do be open to all options. Lots of girls come into the shop and flick through their phone to show us all the images that they’ve saved on Pinterest of their dream dresses, only to try that style on, find that it doesn’t suit them and then be disappointed. A good, well trained Bridal Consultant (like ours!) will know the dresses in store and be able to select gowns that will suit the theme of your wedding and your body shape. If you find a dress you love, buy it. 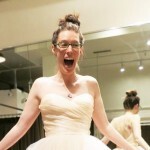 You’re getting married, you’ve come to a bridal shop – it’s the next obvious step! Many boutiques sell samples off the rack, and designers may discontinue a dress while you’re mulling over your decision. If you don’t buy a dress you love, there’s a chance you may not be able to get it once you’re ready to buy. While every boutique and designer is different, it typically takes four to six months to deliver a dress, plus add two to three months for alterations. We’d recommend starting dress shopping about a year before the wedding. Start shopping too early and you may find that styles change and you may miss out on something you’d like better. It’s ok not to shed a tear! Everyone says ‘You’ll know it’s the one the moment you put it on”. Not strictly true. Sometimes it’s a gradual realisation that this is the dress you’re going to get married in: it’s beautiful, you feel comfortable in it, you can see how it’s going to look when it’s properly fitted, you’ve an idea about how to accessorise it and importantly, you’re at ease and happy with your Bridal Consultant – she’s going to be with you every step of the way, so make sure you’re going to enjoy her company in the run up to the big day! And not all Mum’s cry when they see their little girl in her wedding gown. So just because she’s not weeping, doesn’t mean it’s not the right dress for you – maybe she’s saving the tears for the big day!